Carriage Homes at Woods Edge are located off of Woods Edge Parkway and west of 41 in Bonita Springs, Florida. 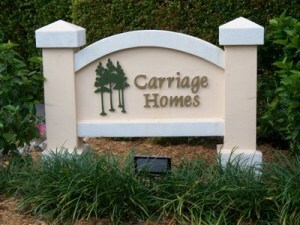 The condos at Carriage Homes were built over the years of 1997 through 2001. There are eight units per building and a total of seventy-two units in the complex. Common amenities at Carriage Homes at Woods Edge include bike and jogging paths a community swimming pool with community room. Nearby conveniences include close proximity to Bonita Beach and Barefoot Beach. A hand full of grocery stores are five to ten minutes away plus dining, both casual and formal, can be found at Coconut Point Mall and 5th Avenue in Naples.